Kasich Wins N.H. Expectations Game – Now What? Chris Christie is serving his second term as governor of New Jersey. He announced his candidacy for president in late June 2015 and has been regarded as an underdog for the GOP nomination. Christie has made a name for himself as a conservative governor in a “blue” state with a bombastic and confrontational style. There are countless instances of the governor taking his critics to task in blunt and direct terms – which have made him a popular figure with many Republicans, while leading some to question his temperament. Despite his aggressive style, as a conservative governor in a state dominated by Democrats, Christie has succeeded in pressing many policies favored by Republicans. To cite just a few accomplishments, there have been no general tax increases in New Jersey under Christie; the state has experienced private sector job growth during his tenure; and the number of state employees has declined. He passed major pension reform for state employees, although the success of those reforms remain in doubt. Christie has also received praise for his handling of the aftermath of Hurricane Sandy, although many Republicans were upset with him for his praise of President Barack Obama on the matter so close to the November 2012 election. Christie has also been criticized for favoring incentives and subsidies for targeted industries and companies, which many regard as corporate welfare. Christie has seen some of his inner circle collapse as the result of various scandals. The “Bridgegate” scandal has seen him sever ties with his campaign manager, among many others. Bill Palatucci, Christie’s former law partner, is considered particularly close to the governor. He is an expert fundraiser and a well-regarded attorney. Christie has a national profile, prodigious fundraising skills, and a great story to tell regarding being able to persuade Democratic and independent voters to support him. His base of support is as likely to be driven by his personality as it is his record and views on the issues, which could cause him problems if he makes any serious miscues. Just as it’s easy to picture Christie dominating a debate, it’s also easy to see his confrontational and bombastic style turning many viewers off or leading him to make controversial remarks that lose him support. Christie has focused his campaign efforts on New Hampshire, hoping to “break out” in that state similar to John McCain’s successful strategy in 2008. His fundraising has been mediocre but not abysmal, and following what most considered to be strong debate performances, he saw his poll numbers in New Hampshire rise in December and early January, when he was tied for third place in the Granite State. His numbers have since fallen, but he is still in contention for a strong finish in New Hampshire that could allow him to mount a credible campaign, although his lack of funds and limited organization in the states that follow New Hampshire would be a serious hindrance. Chris Christie was born in Newark, N.J., to Sondra and Wilbur James Christie in 1962. After the 1967 Newark riots, the family moved to Livingston, where Christie grew up. In high school, he played catcher for the baseball team and served as class president. He is Roman Catholic, and by all appearances he is reasonably devout. His father was a Republican, but it was his Democratic mother who encouraged him to get involved in politics. In 1977, he volunteered for the unsuccessful gubernatorial campaign of Republican Tom Kean, of whom Christie had long been fond. 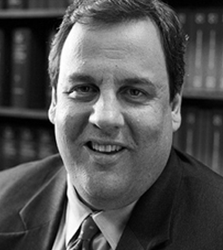 Christie graduated in 1984 from the University of Delaware with a degree in political science and attended law school at Seton Hall University, where he graduated with a J.D. in 1987. He joined the law firm of Dughi, Hewit & Palatucci, where he was named partner six years later. He remains a member of the American Bar Association and served as a member of the election law committee of the New Jersey State Bar Association. Prior to receiving his law degree, Christie married Mary Pat Foster, with whom he now has two boys and two girls. An investment banker, Mary Pat would go on to work at Cantor Fitzgerald, which lost two-thirds of its work force to the September 11 attacks. Christie’s first run for office came in 1993, when he forged a primary challenge to then-New Jersey Senate Majority Leader John H. Dorsey. His campaign ended when it was determined his petition to appear on the ballot was invalid. The next year, Christie was elected to the Board of Chosen Freeholders for Morris County. The losing candidate, an incumbent, sued for defamation. The suit was settled out of court. In 1996, Christie mounted another primary challenge, this time for a seat in the New Jersey General Assembly. Christie lost again, and many attribute this challenge to his losing re-election to the freeholder board, as angry Republicans offered up a primary challenger of their own. Christie returned to his law firm as a lobbyist. In the 2000 presidential election, Christie served as George W. Bush’s campaign lawyer for New Jersey. Upon his election, Bush appointed Christie the U.S. Attorney for New Jersey. In that position, Christie made a point of taking on corruption. During his tenure, which lasted until 2008, he racked up an impressive number of public corruption convictions involving elected officials of both parties. In 2009, Christie filed to run for the governor’s office. He defeated wealthy incumbent Jon Corzine (who had also served as a U.S. senator) with a 48.5 percent plurality of the vote. He was handily re-elected in 2013. Christie’s family regularly attends Mass, and he and his wife have sent their children to Catholic school. Christie cites the role religion plays in his service.2 Christie was known for addressing corruption in what is often considered the most corrupt state in the union. He amassed 130 convictions of various public officials of both parties, all without a single acquittal. According to two anonymous sources, Christie was responsible for pulling Port Authority work from a law firm after a prominent Republican at the firm refused to endorse him during his election campaign.7 Christie’s office has denied the allegation. By most accounts Christie does not seem to have been involved in instigating the so-called Bridgegate scandal, in which senior members of his administration closed several lanes of a vital bridge at rush hour as punishment for the local mayor’s decision not to endorse him (the mayor was a Democrat). But this sort of petty corruption and abuse of power by people close to him does raise questions about the tone he sets and the leadership environment he creates. Christie’s efforts to reform public sector pensions drew the ire of firefighters and police (and a lawsuit by same) while his education reform plans irked the teachers’ unions. He has shown a willingness to stand up to powerful interest groups on both sides of the aisle and seems to relish doing so. Christie is a charismatic and confrontational speaker who is sought after because of his proclivity to speak his mind, including challenging members of his own party as well as members of the public who have questioned him. However, these efforts run him afoul of his fellow leaders as often as they help him. He has publicly distanced himself from tea party adherents, even though he rose to prominence championing many of their ideals. Christie’s ability to win election in a “blue” state suggests strong level of political acumen and an ability to appeal across party lines, although his style of campaigning may be uniquely suited to New Jersey and other East Coast states. His approval ratings in New Jersey have declined recently,10 which could be problematic for his image as a popular governor in a “blue” state. But it is clear that he has gained a national profile and a great deal of admiration as a result of his leadership style. Christie was selected to be chairman of the Republican Governors Association (RGA), a sign of confidence in his leadership skills by his colleagues. The RGA had an outstanding campaign season in 2014, bringing in more than $100 million and helping Republicans hold onto nearly every contested seat and add to their overall numbers, and some of the credit for that must go to Christie. Christie was praised by many for his work after the Hurricane Sandy disaster. Although he roiled Republican Party faithful by embracing Obama (an image used in the president’s campaign ads), it was a display of bipartisanship and a willingness to put citizens before politics. Aside from his working with Obama in the wake of the hurricane, he has been broadly critical of the administration for impeding the free market. For this reason, the Cato Institute awarded Christie a grade of B in 2014 in spite of his reform efforts. This seems in line with his tenure as county freeholder, during which he raised certain taxes, but saw the overall county tax rate decline under his watch. Christie was extremely critical of Congress and the president during the 2013 debate over sequestration, largely over what he saw as a lack of leadership developing a solution.19 He offered similarly critical comments during the debt ceiling confrontation in 2011,20 and in both instances he said getting spending under control should be the focus of any deal. Speaking at a forum regarding education, Christie told one questioner, “Unions are the problem,” regarding education policy, and he has battled New Jersey’s teachers unions on numerous occasions. He has also praised Wisconsin Gov. Scott Walker’s collective bargaining reforms. He does not, however, seem to support right-to-work laws. During his trade mission trip to Mexico, Christie stated that he supports the Keystone XL pipeline and opposes heavy regulations on gas and oil. He also vetoed a ban on fracking in New Jersey, as well as a bill that would have banned the disposal of fracturing waste, which is seen by some as a backdoor ban on the practice. His comments on Ukraine have been vague, telling an audience that Putin wouldn’t have “made the same judgment” about his resolve that the Russian president apparently made regarding Obama but failing to be more specific. He criticized Obama for trying to shift blame on his administration’s apparent surprise at the rise of ISIS,60 and has proposed a no-fly zone in Syria along with pledging to shoot down Russian planes that enter the no-fly zone.61 He has otherwise not given many specifics about how he would address the rise of ISIS and the fate of Syrian dictator Bashar al-Assad. “A lot is being said in this election season about American exceptionalism. Implicit in such statements is that we are different and, yes, better, in the sense that our democracy, our economy and our people have delivered. But for American exceptionalism to truly deliver hope and a sterling example to the rest of the world, it must be demonstrated, not just asserted. If it is demonstrated, it will be seen and appreciated and ultimately emulated by others. They will then be more likely to follow our example and our lead. “At one time in our history, our greatness was a reflection of our country’s innovation, our determination, our ingenuity and the strength of our democratic institutions. When there was a crisis in the world, America found a way to come together to help our allies and fight our enemies. When there was a crisis at home, we put aside parochialism and put the greater public interest first. And in our system, we did it through strong presidential leadership. We did it through Reagan-like leadership. By far the most troubling scandal, however, is the so-called Bridgegate affair. Emails from Christie’s staff that were made public seemed to indicate traffic on the George Washington Bridge was purposely restricted for political reasons. While Christie maintains he had no knowledge of the affair, he quickly fired a top aide in response. Though no formal disciplinary action was taken against him, it is certain this will come back to haunt him. If nothing else, it is a quintessentially New Jersey story of corruption and political vendettas run amok behind a candidate who made a name for himself cleaning up New Jersey corruption. A new scandal has cropped up with Christie’s appointee to the chair of the Port Authority of New York and New Jersey, forcing the resignation of the CEO of United Airlines after it was revealed the company had apparently re-started a money-losing route that was more convenient to the Christie appointee’s vacation home in South Carolina.111 It is unlikely Christie had any knowledge of this, but at the least it is likely to be politically damaging to Christie.